My current favorite podcast is Hit Parade, by music writer and Billboard chart historian Chris Molanphy at Slate. Each month, Chris takes his listeners on an incredibly thoughtful, well produced, and well researched journey into a specific music artist or genre and what impact they / it had on the musical world as measured by performance on the famous Billboard music charts published by Billboard Magazine. As an avid listener of the Hit Parade, I’ve learned fun music trivia like how Creedence Clearwater Revival (of “Proud Mary” and “Bad Moon Rising” fame) holds the record for the most #2 songs on the Billboard Hot 100 chart without ever having a #1 song. Or that Vanilla Ice’s “Ice Ice Baby” was the first rap song to ever top the Hot 100. I’ve also learned about more meaty social issues reflected in music, like how the original reporting methodology behind Billboard actually made it harder for minority artists to ascend the charts which is why the first African American rap song to top the Hot 100 (“Set Adrift On Memory Bliss” from P.M. Dawn) didn’t happen until 12 months after Vanilla Ice. The common foundation that all Hit Parade podcast episodes are built on is the Billboard charts, the reporting standard for music popularity in America, which has served as the catalyst, the source, the proof behind Hit Parade’s fascinating insights. Spanning back to 1958, Billboard Magazine has diligently cataloged the music zeitgeist into the easiest format to understand and subsequently analyze: a single ranked list called the Hot 100. From that moment on, that list has been closely followed by not just artists and industry insiders, but ordinary music listeners too (remember Casey Kasem’s “American Top 40”?). And now Chris Molanphy has taken Billboard chart research and deduction to whole new heights that are both fascinating (did you know that Stevie Wonder was the youngest solo artist to top the Hot 100 at 13 years of age?) and inspiring. Inspiring because in my own industry of consumer technology, there’s a similar source of truth, neatly organized into a ranked list, where insights ranging from the whimsical to the profound can be learned about the state of consumer startups. In many ways, this chart has become the reporting standard for not just mobile apps, but rather overall consumer startup success. What chart am I referring to? That would be Apple’s iTunes App Charts. When the iOS App Store first launched in July 2008, it had only 500 apps. 30 days later, that number had tripled to 1,500 prompting Apple CEO Steve Jobs to comment in an interview that the App Store was “much larger than we ever imagined”. Even Steve Jobs’ imagination sometimes wasn’t big enough because fast forward 10 years, and the App Store has grown more than 1,000 times over to 2 million apps and counting. With adults spending nearly 4 hours every day on their mobile phones (projected to be greater than even their TVs this year), these 2 million mobile apps are the primary outlets that people pour their attention into. Mobile app usage has captured 25% of a person’s waking day, and that captive time is where consumer behavior is being defined and where consumer businesses are being built. So understanding what apps are popular on the App Charts is both culturally interesting and also business critical in the world of consumer startups. And the source of truth for that understanding is the iTunes App Charts. Note, there’s also the first cousin of the iTunes App Charts, the Google Play App Charts, which ranks the most popular Android apps of the moment across similar categories. We’ll get to that later, but for now let’s focus on the iTunes App Charts. The iTunes App Charts is a constantly updating list of the most popular iPhone apps of the moment, ranked by downloads, across a variety of categories (like Overall, Gaming, Social, etc.) and geographies. It provides a truly dynamic look into what activities more than one billion Apple device users are spending their time and money on, and the insights that data provides are both educational and entertaining. There are entire companies dedicated to analyzing the App Charts, and over the years I’ve spent hundreds of hours querying APIs from App Annie (the best of the chart analysis companies) to study consumer behavior through the lens of mobile app installs. For example, on March 22nd, the number one most popular iPhone app in the entire US was an app that just a month ago was so unpopular that it didn’t even register on the charts. Guess what that was? The NCAA March Madness Live app, which makes perfect sense given the start of the College Basketball Tournament that week. The March Madness Live has a particularly unique chart pattern; like clockwork it rockets to number one on the charts each March, and then disappears into obscurity after the basketball tournament ends. December also has some obvious seasonal trends with Santa tracker apps rocketing up the App Charts before Christmas, followed by workout apps topping the charts in the new year. Here’s another iPhone app that follows a clear seasonal trend around the holidays: Amazon Alexa. The app shot to the number 1 overall most popular spot on the App Charts on December 25th the past 2 consecutive years, which make sense with people opening up gift-wrapped Alexa devices on Christmas day. But the app also saw a big spike in popularity on July 19th. Why? Because Amazon’s Prime Day sales event happened 2 days earlier and all those newly purchased Alexa devices sent via 2 day free shipping devices arrived on the 19th. Sometimes the insights are more serious. Take for example the Zello Walkie Talkie app, which turns your iPhone into an old school CB radio. For a few days each of the past two Septembers (2017 and 2018), Zello Walkie Talkie was the single most popular iPhone app in the country. What caused this? Maybe a back-to-school phenomenon of kids wanting to talk to their friends after a long summer hiatus? Good guess, but wrong guess. On September 5th, 2017, Hurricane Irma hit peak intensity and the very next day Zello Walkie Talkie topped the App Charts as people in the hurricane path downloaded it out of safety concerns. The next year on September 10th, 2018, Hurricane Florence hit peak intensity and Zello Walkie Talkie shot to number one again the very next day. 2012: In October, Snap first cracks the Top 10 most popular iPhone apps in the US. 4 months later, the company would complete a $13.5M Series A fundraise in February 2013. 2013: The very next October, Duolingo first breaks into the Top 10 apps rankings. Also 4 months later, they would complete a $20M Series C fundraise in February 2014. 2013: Yik Yak enters the Top 10 rankings for the first time in September. Just 2 months later in November, Yik Yak would announce a $62M Series B financing. 2015: In April, Dubsmash would hit number 3 on the App Charts, their all time peak. 4 months later in August, they would raise a $5.5M Series A. 2016: Houseparty first breaks into the Top 10 most popular iPhone apps in May. By year’s end in December, they would close a $52M Series C fundraise. 2017: In September, TBH becomes the number one most popular iPhone app in the US after being unranked just 1 month prior. Facebook would acquire TBH less than a month later in October. 2018: Dosh starts off the new year strong entering the Top 10 rankings in January. They would go on to raise a $45M Series A round 3 months later in April. An iPhone app gains momentum on the iTunes App Charts, the source of truth for app popularity. Startup investors pounce as the inflection in ranking becomes clear and invest in the next hit app. Rinse and repeat. Seems straightforward right? Yes, except for one thing that may not be as straightforward: it’s not happening anymore. I’ve written a previous blog post about the slowdown in breakout consumer startups that’s happened since 2013. In that post, I focused primarily on the strengths of the incumbents (Facebook, Instagram, Apple, Amazon, Google, Snap, Uber, etc.) as the main reason why consumer startups have experienced limited success recently. And while the undeniable dominance of the incumbents is certainly a huge hurdle for any startup, an even scarier hurdle is something everyone in tech — startups and incumbents alike — are complicit in. We’ve all made mobile computing really good. Think back to 2008 when the App Store first launched, with its inaugural 500 apps. While incredibly promising, the mobile computing experience was in practice very limited. Just to highlight a few of these limitations: the camera took crappy photos, messaging was expensive, you couldn’t get accurate turn-by-turn driving directions, legal music and movies were expensive and required downloads in advance, and so on. But as the number of apps in the App Store exploded, those limitations became addressed by those very apps. Instagram made crappy photos look good, WhatsApp made messaging free, Waze gave us time saving driving directions, Spotify made music affordable and on demand, Netflix and Hulu did the same with movies and TV, and so on. Paraphrasing Elon Musk, the greatest consumer problems of mobile computing have essentially been solved by apps. To be clear, we still need apps, which is why app downloads have stayed fairly consistent. To illustrate this, I’ve charted the number of weekly downloads it would take to qualify as a Top 30 most popular app on the iTunes App Chart, going back 5 years (courtesy once again from App Annie data). The trend line has held fairly consistent. Over the past 5 years, you’ve needed to garner about 230,000 downloads a week to break into the Top 30 rankings on the iTunes App Charts for that week. But the type of apps users are installing has changed in one critical way. Below I’ve computed the average number of days a Top 30 weekly app has been available for download in the App Store — in other words, this is the official age of the app. In 2014, the average Top 30 app had been available in the App Store for 625 days (i.e. they were less than 2 years old). Today, the average Top 30 app has been sitting in the App Store for 1,853 days, making it more than 5 years old. So while users are collectively downloading the same number of popular Top 30 apps, they are choosing to download more established, mature apps (that have been around for over 5 years) and not fresh, upstart apps (that have been around less than 2 years) like they did back in 2014. The old is what’s popular and in demand, not the new, and that trend does not bold well for consumer startups. 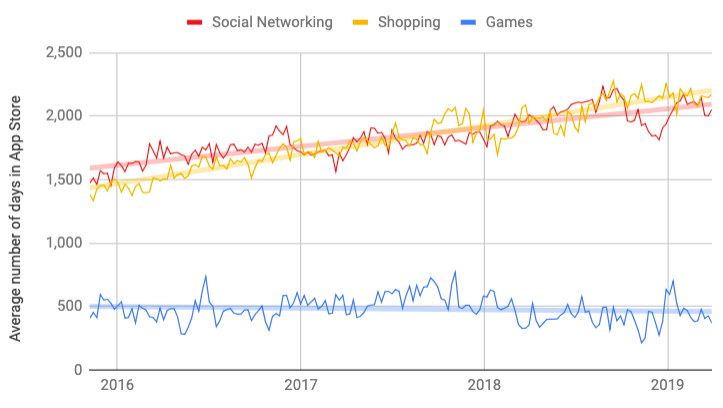 And the same trend is true for Android apps on the Google Play store, where the average age of a Top 30 weekly app has grown from 18 months in 2014 to almost 4 years in 2019. To explore this insight further, let’s now review the same metric of average age of a Top 30 app, but split it out by a few key categories. The App Charts tracks 25 different subcategories that an app can be classified as (such as News, Finance, Education, etc.). 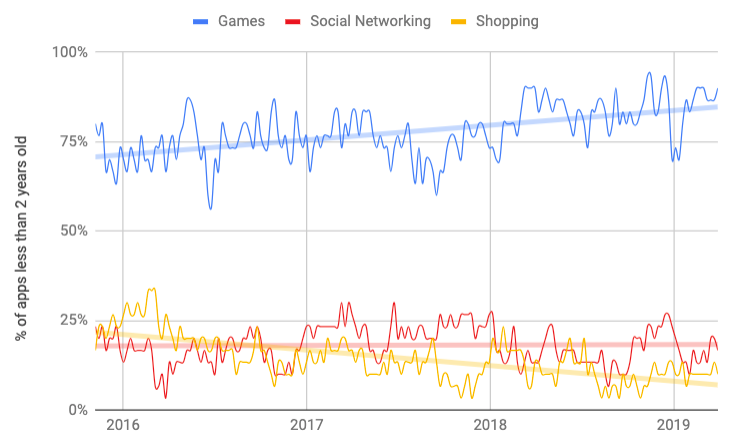 Below, I’ve pulled App Annie data for three categories on the App Charts: Social Networking apps, Shopping apps, and Games apps. The data goes back to 2015 when the Shopping category was first introduced. As you can see, the Social Networking and Shopping categories follow the exact same trend as the Overall chart. In all three cases, the most popular apps are mostly older, mature apps starting with a 4 year average age in 2016 and growing to a 5 year average age by 2019. Contrast that with the Games category where the average Top 30 ranked game is only 16 months old, and these upstarts have actually gotten slightly younger over the years. Here’s another way to think about it. Of the Top 30 Social Networking and Shopping apps, each week only 13% of those apps are upstarts less than 2 years old, down from 21% in 2015. Whereas for Games category, each week 85% of the Top 30 games are upstarts, which is actually an increase from 72% in 2015. As mature apps dominate the Social Networking and Shopping charts (and the Overall apps chart in general), upstart games are proving to be the most popular. There are many factors as to why that is, but I’ll offer up a simple explanation. In the Games category, mobile games fail to satisfy customer wants and needs (or only satisfy them for a short period) so users are constantly hunting for upstart alternatives. But in the Social Networking and Shopping categories, the mature apps have met the customer needs so well over such a sustained period that users have stopped looking for upstart solutions. If it ain’t broke, don’t fix it. Remember the “There’s an app for that” series of iPhone commercials that highlighted the myriad of consumer tasks that the App Store could solve? 2 million apps later, it’s not only come true, but come so satisfyingly true for consumers that a more accurate tagline today might be “There’s THE app for that”. So now what? Other than mobile games, should we all just give up on starting or investing in upstart consumer apps? The App Charts data is delivering a clear message: users have settled on their favorite apps, and those mature apps have won the popularity contest played out publicly on the charts. The resulting effect is that distribution is incredibly hard for upstart apps trying to break into the top rankings, which are crowded with these entrenched winners. But that doesn’t mean consumer startup success is unachievable. Here are 3 ways startups are combating this harsh App Chart reality: by accepting it, by avoiding it, and by fighting it. The acceptance strategy for startups is acknowledging you might not crack the Top 30 most popular apps but being okay with that. Take for example the highly successful mobile meditation app Calm. It recently was crowned a Unicorn (i.e. a valuation greater than $1 billion dollars), will reportedly earn $150 million in annual revenues, and is profitable. And it’s never broken into the Top 30 most popular apps at any point in its 6 year history. Or how about a fellow Unicorn startup Opendoor, which allows users to tour and purchase homes through its mobile app. Opendoor has never even made an appearance on the App Charts — not once has it been one of the Top 1,500 most popular apps — but it’s still built a tremendously successful business now valued at nearly $4 billion dollars. Not breaking through on the charts means that your app user base will be limited. But just because you can’t find a billion user audience doesn’t mean you can’t build a billion dollar company with a business model that works just fine with fewer customers. The avoidance strategy for startups is acknowledging the tremendous difficulty of climbing the App Charts and deciding to avoid the charts altogether by building for a different platform. Mobile may currently be where people spend the most time, but there are other platforms that still command meaningful user attention. Take the living room with the Echo, which startups are starting to build interesting businesses on top of thus avoiding the App Store dogfight. Or how about something old school like the Chrome desktop browser, used by more than 1 billion people. Chrome has its own app store called the Web Store, with tens of thousands of extensions users can install. And Honey is an example of a startup that has built a very impressive business entirely as a browser extension. As Sun Tzu says: “in war, the way is to avoid what is strong and to strike at what is weak”. There are other app stores with weaker competition to strike instead of battling the dominant chart topping iPhone apps. 5 years ago back in 2014, there was an average of 4.2 non-gaming upstart apps (so young apps less than 2 years old that aren’t in the Games category) that made it onto the Top 30 most popular app charts each week. Today, that number has dropped down to an average of 0.15 upstart apps (less than 2 years old) breaking into the Top 30 charts each week. Over the past 52 weeks, only 8 upstart apps have managed to accomplish this weekly feat. 8 in the entire past 12 months. That’s it. Doing the math, it’s roughly 28 times harder for an upstart app to crack the top echelon of the App Charts now than it was 5 years ago. Most would look at that stat and give up, concluding that building a popular consumer app these days is impossible. But entrepreneurs aren’t like most people. Those who are brave enough to start a company might see the world differently. The odds are long, and the likelihood of success lower than ever. But 8 examples of upstart success on the App Charts proves there’s still a chance. And a chance might be worth fighting for.